Oops. If you look closely, you'll see that I crosshatched too aggressively and accidentally cut through the peel. The goal is to keep it in one succulently satisfying slice. Of course, I'd eaten them several times at home, though to be honest, the American ones ripen poorly and often taste a bit sour. Their Malaysian counterparts were properly tropically delectable but when peeled and sliced, I found them oh, so slippery to handle. It wasn't until I ate fresh mango in the Vietnamese home of my friend, Song, that I fell completely, utterly and madly in love. 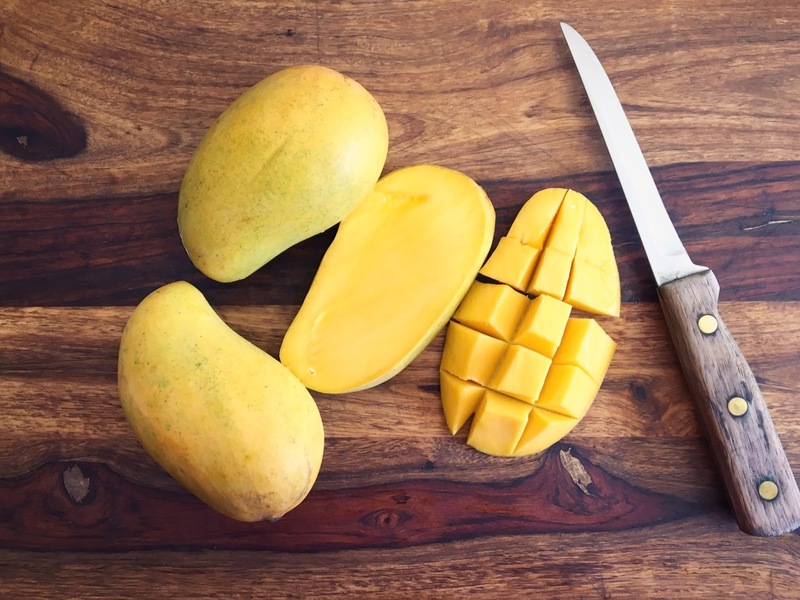 Her secret - which apparently to Asians is no secret at all - is to slice along the length of the mango with a cut that runs next to the long, flat pit. Repeat on the other side of the pit. Once the best bits of the fruit have been thus carved away, there's no need to peel it. Simply score the slices in a crosshatch pattern to create bite-size squares, leaving the fruit attached to the peel. Then pick up the whole luscious affair, pressing your fingers on the peel side of the slice to open the spaces between the squares, and bite off each delectable chunk. Once I got the hang of this presentation style, I went a bit wild. After snarfing down the two fleshy halves of my own mango, and gnawing around the remaining pit, Song couldn't help but notice my enthusiasm. She offered me a second crosshatched mango, And then a third. I kept eating until she ran out of fruit. The next day, she stopped by the street market to buy more mangoes, and with a twinkle in her eye, sat me down in her kitchen for another session. This time, I sliced for myself. And now, every time I eat a mango - as I did today - I cut it into proper Asian squares and give thanks for my generous and clever friend, Song.